The dog days of summer are in full swing! As parents count down the days until the normalcy and routine of the school year, it seems the whole family could use a breath of fresh air (or a splash of cold water). We still have a few weeks until those days arrive, and the summer weather is showing no sign of stopping. Thankfully, anyone who lives in central Texas can consider themselves blessed due to the plentiful options for fresh water, from pools to springs to lakes. Earlier this summer we made a list of waterways in the Hill Country, and we wanted to remind you of some of those spots...as well as mention a few more top-notch places to cool down as the summer rages forward! Thompson Island is a bit of a San Marcos secret (but not really) because it is located on the east side of I-35. Known for being a "locals only" swimming hole, Thompson Island is the perfect destination for explorers who want a nice, shaded day next to the water. Take a dip in the chilly stream and let the waterfall revive your soul from the brutal summer. Deep Eddy Pool is a man-made pool in Austin, TX. Not too far from Barton Springs Pool, Deep Eddy is popular with adults who want to get some Olympic laps in for exercise and for children who like smaller wading pools. It is as chilly as a spring-fed pool can be, which probably helps swimmers get in some record times. Occasionally, they will host movie nights on an inflatable screen that patrons can watch while they swim. Wanting to spend a day in Austin? If you risked the August weather and decided to hit the town, you might be ready for a respite from the heat. 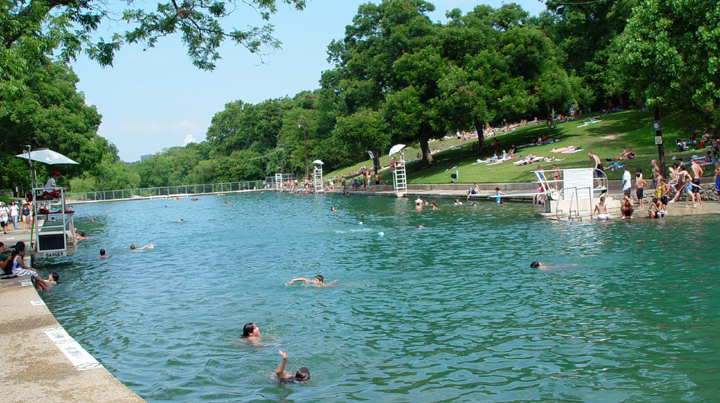 Luckily, Barton Springs Pool sits inside Zilker Park, right outside of downtown Austin. Although it is popular and often crowded, it doesn’t take away from the experience of the pool. Austin locals are weird (as we all know), but there is a friendly nature about them, and who knows, you might make some new friends who taught you how to tye-dye or cross-stitch - all at Barton Springs! Krause Springs is far enough away from the city and into the Hill Country that it satisfies the escape we all need from our day-to-day lives. The area is made up of 32 springs, and most of them feed into a pool which then makes its way into Lake Travis. Once again, the Texas Hill Country maintains its “heaven on earth” status with so many spring fed swimming holes. The park is on 115 acres and provides spots for campers and tents to set up for a longer stay. Feel young and free once more by grabbing on to the rope swing and less-than-gracefully flopping into the water. Sewell Park is one of my favorite swimming holes. By no means is this a secret spot, as it goes through the actual Texas State University campus, but its existence has created a culture in San Marcos that the locals foster. Sitting at the beginning of the San Marcos River, Sewell Park has swift currents and chilly water. The water is so clear that you can see the bottom of the river 8+ feet down from the surface! If you happen to pass through Wimberley on a hot day, don’t pass up the opportunity to go to Blue Hole. Shop all day at Market Days, and don’t forget to bring your swimsuit to wear later. Located right off the square, Blue Hole is a local favorite spot to cool down on days off. It is considered a gem of the Hill Country and has always felt like it came out of a novel. Fed by natural springs, this swimming hole is perfect for the whole family. The Wimberley folk fought to keep this place free from developers and turned it into a city park, and you will notice the loyalty and care that residents show for the area. Deeper into the mystical Wimberley woods is a little area known as 7A. Utilizing the Blanco River for swimming away from the summer blues, 7A is a dam-like swimming hole where you can walk across the river and hop in at any point. It is also the name of a ranch and resort nearby, which offers great deals on lodging and the cultural experience of Pioneer Town. Again, Wimber-folks are proud of their treasures, so if you decide to swim here, make sure you play it cool and do as the locals do. Pace Bend is a massive 1300+ acre park on Lake Travis (between Marble Falls and Austin). With over nine miles of shoreline in the park, there is always a spot to set up camp. There are some swimming areas (Mudd Cove, Kates Cove, and Gracy Cove) for those looking to relax and make some new friends. Most people who come to Pace Bend Park come for the opportunity to cliff jump. Over the past several years, the water has been too low for the park to recommend jumping, but it has risen to levels in some areas that are great for taking a 30 foot leap into the waters below (but please be careful!). After you jump in, the next challenge begins with climbing back up the rock face to get back to your campsite. Make a weekend out of your trip to Pace Bend Park! James Kiehl Park is a great spot to cool down for those of you down in the Kerrville area. It’s a new park for the area that gives patrons access to a section of the Guadalupe River only known by a few locals. Bring some food and the dog (make sure they are on a leash) and set up for a day swimming in the water when the river fills up.